PASO ROBLES, Calif. (PRWEB) – The Garagiste Wine Festival, which was named America’s Best Wine Festival by USA Today, returns February 8th – 10th to Solvang, which was named One of America’s 10 Best Small Historic Towns by USA Today. Tickets are now on sale. This marks the seventh year that the Garagiste Festival: Southern Exposure has showcased the wines of some of California’s best small production winemakers in one of California’s most charming small towns, which is celebrating its 107th anniversary this year. Solvang is in the heart of the renowned Santa Ynez Valley wine country, just north of picturesque Santa Barbara, California. 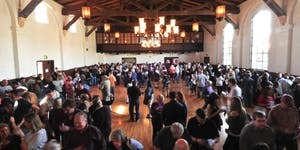 Over 40 winemakers from Santa Barbara County and across California converge at Solvang’s Mission-style Veterans’ Memorial Hall to pour over 150 wines over three days of events which include the continuation of the festival’s ‘Original Garagiste’ seminars, moderated by Garagiste Festival Co-founder and KRUSH radio host, Stewart McLennan, and, this year, featuring Central Coast winemaking legend Ken Brown of Ken Brown Wines. Brown, whose Ken Brown Wines focuses on very small lots of Pinot Noir from the finest vineyards of Sta. Rita Hills, is recognized as one of Santa Barbara County’s pioneering winemakers and innovators. Not only was he among the first vintners to realize the tremendous promise for Pinot Noir and Chardonnay in Santa Barbara County, but he was also the first winemaker to introduce the Syrah grape, as well as Pinot Gris and Pinot Blanc, to the region. He was founding winemaker at Zaca Mesa Winery and spent 20-years at Byron Vineyard and Winery which later sold to the Robert Mondavi family. In this seminar, attendees will learn how he helped shape the Santa Barbara wine scene and why he ultimately returned to small-lot winemaking. The Garagiste Festival: Southern Exposure 2019 kicks off on Friday, February 8th from 6:30-9:00pm with the very popular “No Repeats, Rare & Reserve,” where attendees can get up close and personal with the winemakers as they share limited Club Only, Library and Pre-Release bottles and Barrel samples, and enjoy a BBQ buffet from local favorite Tim’s BBQ. On Saturday, the seminar with Ken Brown, “Original Garagistes: A Deep Dive & Tasting,” runs from 11:00 am – 12:30 pm and includes a Wine Country boxed lunch (VIP/Weekend pass ticket holders only). The day continues with the main event, the Grand Tasting, from 2-5pm showcasing over 40 winemakers pouring 150+ wines and 20+ unique varieties. All tickets include unlimited tastes, complimentary cheese and charcuterie and a souvenir Stolzle crystal wine glass – plus a Silent Auction full of enticing wine packages which benefits The Garagiste Scholarship at Cal Poly. On Sunday, Garagiste Passport Day returns, offering discounts and special offers to festival attendees at area wineries. Dubbed “tasting nirvana”, ‘strange and wondrous’, and “one not to miss” by the LA Times, the Garagiste Festival is renowned for its renegade spirit, passionate winemakers, handcrafted wines and rules-breaking, ‘no snobs allowed’ ethos. Launched in Paso Robles in 2011, the festival features the wines of commercial garagiste* winemakers who make under 1500 cases at festivals across California, including Solvang, Sonoma, Los Angeles and Paso Robles. Over 350 different wineries have poured over 3,000 wines for over 10,000 wine lovers at Garagiste Festivals since inception and the festival has raised over $125K in support of The Garagiste Scholarship at Cal Poly. Tickets are very limited and Garagiste Festivals always sell out. To buy tickets, go to: https://bit.ly/2Bcs0ck. For breaking festival news and special discounts, sign-up for our free newsletter, The Dirt at http://garagistefestival.com/sign-up/ or follow us on Twitter (@GaragisteFest) or Facebook. *First time pouring at the Solvang Festival. AEB, California Winery Advisor, City of Santa Ynez Valley, Digital Dogma, Distinctive Glassware, ETS Laboratories, Farm Credit West, Glenn Burdette, G3 Enterprises, Hamlet Inn, The Hanover Insurance Group, House of Copper, Laffort U.S.A., mWEBB Communications, Wine Industry Insight, Wine Reach App, WiVi Central Coast Conference & Tradeshow. For sponsorship info, email info(at)garagistefestival.com. The Garagiste Wine Festival (http://www.garagistefestival.com), named the ‘Best Wine Festival in the US in 2018 in USA Today’s 10Best Readers Choice Awards, is the first and only wine festival dedicated to the undiscovered and under-recognized American artisan ‘garagiste’ producers who are making some of the best, most exciting, handcrafted small-lot production wines in the world. Founded by fellow garagistes Stewart McLennan and Douglas Minnick, the Garagiste Festivals are committed to discovering the best and most innovative limited-production winemakers and promoting and showcasing them to a broad audience of discerning wine consumers. In addition to its flagship annual festival in Paso Robles, CA, the Garagiste Festival line-up includes Garagiste Festival: Southern Exposure, featuring Santa Ynez Valley garagistes; the Garagiste Festival: Urban Exposure, in Los Angeles; the Garagiste Festival, Northern Exposure, in Sonoma; winemaker dinners, a newsletter, garagiste profiles and more. In addition to being named the US’ Best Wine Festival, the Garagiste Festival was named one of the ‘Top Nine Incredible Epicurean Vacations’ in the world by ABC News, * “one of the premier wine events of the year,” by the LA Times and “Best Festival” by Sunset Magazine’s ‘Best of the West.’ The festivals are produced by Garagiste Events, a non-profit dedicated to furthering the education of future winemakers and those training for employment within the wine industry. Proceeds from the festivals support the Garagiste Festival Scholarship fund of the California Polytechnic State University at San Luis Obispo Wine and Viticulture Department. *Garagistes (garage-east) is a term originally used in the Bordeaux region of France to denigrate renegade small-lot wine makers, sometimes working in their “garages” (anything considered not a chateau), who refused to follow the “rules,” and is now a full-fledged movement responsible for making some of the best wine in the world. The Garagiste Festivals were the first to shine a light on the American garagiste winemaker in 2011.